… and then there’s Jon Pertwee. The Third Doctor. Jon Pertwee’s incarnation of the Doctor clearly owes a lot to the Sixties British television series of “The Avengers” – specifically, the John Steed/Emma Peel incarnation of that show – and Pertwee’s debonair, aristocratic and often pompous man of action remains even today something of a unique portrayal of the Doctor. It’s very, very good, and extremely entertaining … but the Pertwee era of Doctor Who is a reflection of the time in which it was made. I suspect that if someone really tried to update Pertwee’s performance for the modern version of Doctor Who – the Twelfth Doctor’s costume details notwithstanding – it’d either come across as wildly, ridiculously camp, or require so much action and special effects that the budget would be astronomical. If you’re not familiar with Jon Pertwee’s tenure in Doctor Who’s long history, I can think of no better introductory story to start with than the wonderful “Claws of Axos”. 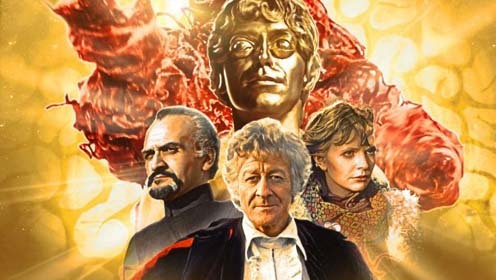 While not the best story of the Third Doctor’s era – that honor would more rightfully belong to “Inferno”, or perhaps “The Daemons” – “Axos” is a beautiful example of everything that was fun and great about “Doctor Who” at this time. It’s got Jon Pertwee and Katy Manning, with their chemistry between the Third Doctor and companion/best friend Jo Grant at its very best. It’s got the full supporting cast of UNIT – Brigadier Lethbridge-Stewart, Captain Yates, and Sergeant Benton – all crisp, brilliant and at their action-packed finest. And it’s got Roger Delgado as the original (and the best) Master, charming and subversive and ruthless, displaying just why the evil Time Lord is perfect as the Doctor’s “best enemy”. In a lot of ways, “Axos” is like a ‘greatest hits’ story for Pertwee’s Third Doctor, containing bits and pieces of everything that made his run on the show such a blast, and distilling it all into four fast-paced episodes that are still just a pleasure to watch. The story itself is simple but solid – an alien race called the Axons come to Earth, offering humanity a fantastic gift called Axonite that seems too good to be true, in exchange for some help with their crashed spaceship. The aliens come across as these enlightened, flower power alien hippies … which is a disguise that the Doctor, of course, sees through right away. However, unable to prove his suspicions, he’s forced to work with UNIT to help transfer the Axonite into human hands – but meanwhile, he continues to work to expose the Axons for what they really are! It’s not the deepest plot in the annals of “Who” history, but it’s enough to make a really intriguing tale. The action sequences are great, with the fights between UNIT and the Axons among the best the show ever featured in those early years. Pertwee’s at his charming, arrogant best, managing to be politely condescending to the bureaucrats while managing to con his way to getting access at a nuclear power plant, as much for his own selfish purposes as for stopping the Axon menace. And the Axons – and their crashed spaceship – are great, looking slightly surreal and psychedelic, which perfectly fits a lot of the ‘trippiness’ of the story. The constant misdirection in the story is pretty great to watch as well. While it’s not of the complexity of, say, one of Moffat’s better “Modern Who” tales, “Axos” features a lot of unexpected twists. Virtually all the characters in this story do something surprising at some point during its four episodes, and it’s not always immediately clear why they’re doing those things. These many, many twists are all resolved fairly quickly, but they go on long enough for the viewer to keep guessing as to what’s really happening, and enough to make things very interesting – and very entertaining – indeed. 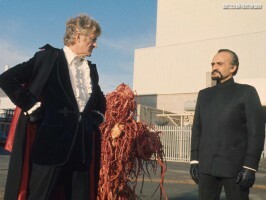 One particularly genius moment comes in “Axos” when the Axons go on the attack in full-on spaghetti monster mode, with the Doctor and Jo taken prisoner by them … and the Master and UNIT are forced together to fight them instead. And later on, after the Doctor’s inevitable escape, it’s the Doctor himself who joins forces with the Master against the Axons. This uneasy alliance between the two Time Lords is something that gets lost later in the classic series with Anthony Ainley, for the most part, and certainly with John Simm’s portrayal of the Master – Delgado’s original Master wasn’t always obsessed with killing or destroying the Doctor. In many of his stories, he’s doing something nefarious that doesn’t initially involve the Doctor, but his activities catch the Doctor’s attention – and many times, it’s actually in the Doctor’s interest (or the Doctor’s allies) to help the Master, either to buy some time, or to prevent something even more awful from happening. There’s a fascinating dynamic between Pertwee’s Doctor and Delgado’s Master that’s usually wonderful to watch, a game of one-upsmanship where the two mortal enemies have a healthy respect for one another, even if the game’s a deadly one to play. There’s still some flaws, to be sure. Paul Grist’s ‘American’ accent for Filer is atrocious, and Derek Ware’s English country accent is even worse. And there’s some story elements which – typical of the time – not only defy logic, but proceed to club logic to death, kick logic a couple of times in the side for good measure, and then bury logic out in the deep woods somewhere to rot in ignominy. (Why do the Axons make a copy of Filer when they don’t need to? Why do they need to extract the secrets of time travel from the Doctor, when they’ve already been working with the Master? AAAAAARRRGH.) But it’s nothing more egregious than any other Doctor Who story of pretty much any era, and as with plenty of other Who stories, the good far outweighs the bad in “Axos”, making it a most enjoyable watch. If you’re just interested in checking out “The Claws of Axos”, you can find the original DVD release on Amazon or eBay (or other similar sites) pretty damn cheap, and it’ll be worth every penny. I’d seriously recommend getting the Special Edition DVD of “Axos”, though, if that’s a viable option for you. In addition to having the original video restored to much better condition by the Doctor Who Restoration Team, there’s a few “behind-the-scenes” and “making-of” features included in the DVD that are totally worth checking out. In particular, I found the “Studio Recording” feature interesting, as it shows the video recording of all the studio sequences, including what’s going on between takes.